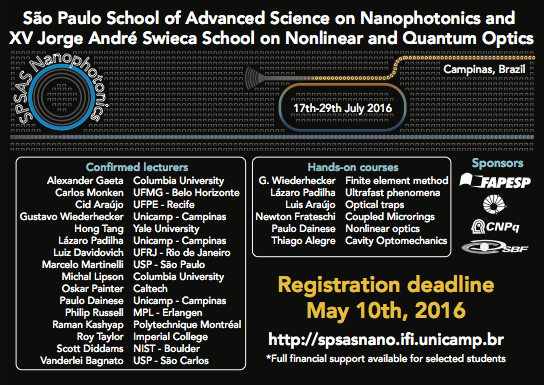 The joint São Paulo School of Advanced Science on Nanophotonics and XV Jorge Andre Swieca School on Nonlinear and Quantum optics, will be held at Campinas from July 17th to 29th. For this school a group of 50 international and 50 Brazilian students will be selected to join two weeks of intense lectures and experimental courses tought by leading experts on nanophotonics, nonlinear optics and quantum optics. The registration deadline is on May 10th.